I have always wanted a time machine. And I’ve been looking for one ever since childhood. Greg Hatten has built one. It’s pretty simple. Not the sci-fi version you might imagine — with the flashing lights and whirling gizmo parts and mish-mash of wires. This one is made of wood. Just wood. On dry land, it’s static — beautiful and static — like a piece of fine furniture. The attention to craft can be seen in alternating colors of wood, patterns of grain, fit precisely in joints. The hull is symmetrical, flared in the middle and coming together with an elegant sweep into points at either end. 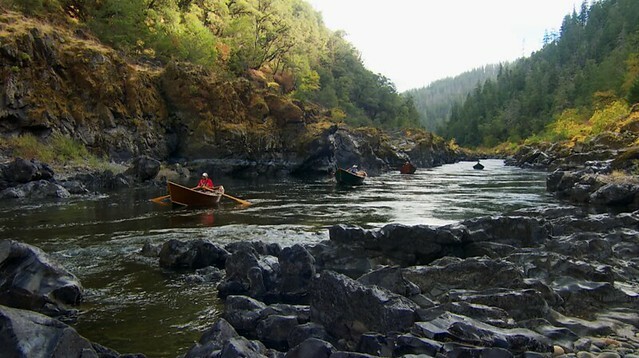 This entry was posted in Fly Fishing Travel, Oregon fly fishing links, Oregon Fly Fishing Tips, Southern Oregon. Bookmark the permalink. Great article about two great guys, their woodies, and a special river. OPB is reshowing the video of the trip at 6:30 Sunday. Greg and Randy will be at the McKenzie Wooden Boat Festival April 27 at Eagle Rock Lodge. Come on up, have a burger and brew, and see some great wooden boats.